← SCARY SCRIBES: HEAR THE INTRO AND PROMO SPOT; WATCH THE TRAILER! What if you’re not a “People Person”? Find out in Stacey Longo’s short story on Scary Scribes tonight! Stacey Longo livin' it up! Reminiscent of Shirley Jackson’s “The Summer People,” humorist-turned-horror writer Stacey Longo’s “People Person” just might make you think twice your summer paradise—this month on Scary Scribes. Stacey’s short horror fiction has appeared in several scary anthologies, among them Malicious Deviance and Daily Bits of Flesh. She’s best known, though, for her zombie fiction—like “Wedding Day Blues,” in which a bride refuses to let her groom’s newly-dead status ruin her big day. 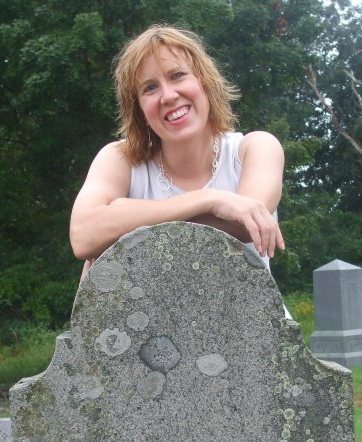 After the reading, we’ll chat with Stacey about the truth behind “People Person” and some of her zombie stories which have been featured in the anthologies Zombidays: Festivities of the Flesheaters, Rapid Decomposition, and Hell Hath No Fury. Check Stacey out at http://www.staceylongo.com/, and listen live at 6 p.m. tonight here! Posted on January 29, 2012, in Scary Scribes and tagged audio books, New England Horror Writers, Paranormal Eh? Radio, Paranormal Radio, Scary Stories, Shirley Jackson The Summer People, Stacey Longo. Bookmark the permalink. Leave a comment.